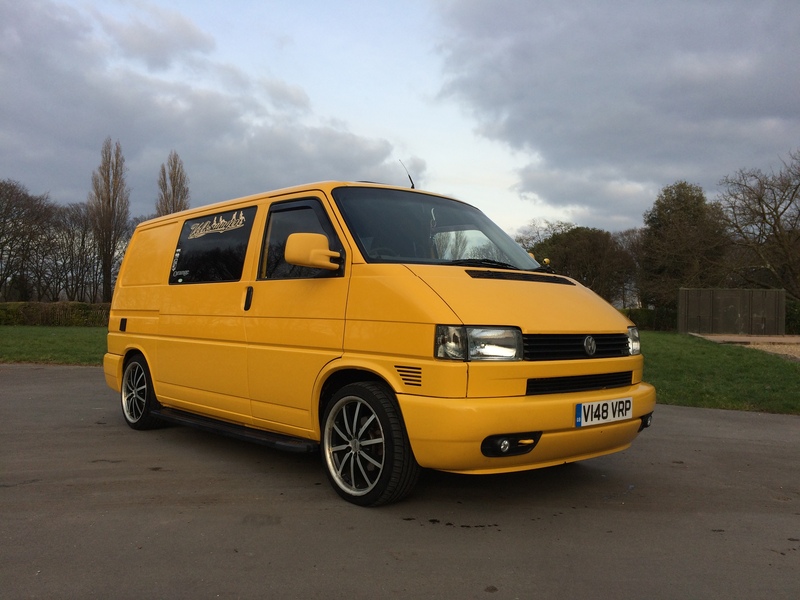 One of the things that attracted me to Bumblee when we were searching for our Urban Caravan was purely cosmetic, the lovely looking Audi style day running lights or DRL’s for short, here they being modelled by Bumblebee. Whilst they look very nice and are quite expensive to buy they are rubbish as lights. Visibility at night is dreadful, so much so we can drive around at night with the full beam on and nobody flashes us, true story. I thought it might be the bulbs so invested in a set of H1 Osram night breakers, they marginally improved the situation. There are a number of wiring looms you can buy that allegedly improve the situation specifically for DRL’s with projector style lights by combing the side lights and full beam or by increasing voltage to the bulbs, the problem you run into is by increasing the voltage to the bulbs you raise the bulbs temperature which in turn melts the projector cover and combining the side lights and full beam is only helpful when you have your full beam on, not really a solution. 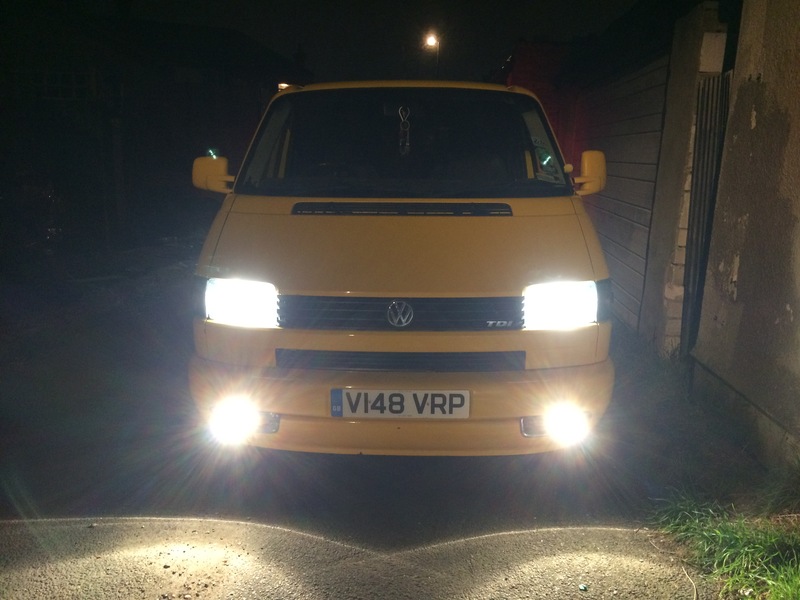 I spoke to Martyn at Travelvolts who confirmed I had done pretty much all I could do and the only way to see an improvement would be to go back to standard lights, fit an upgrade loom and night breaker bulbs so after a year and a half of bad night time driving it was time to take the plunge. After doing a bit of research I bought the following from eBay and Amazon. 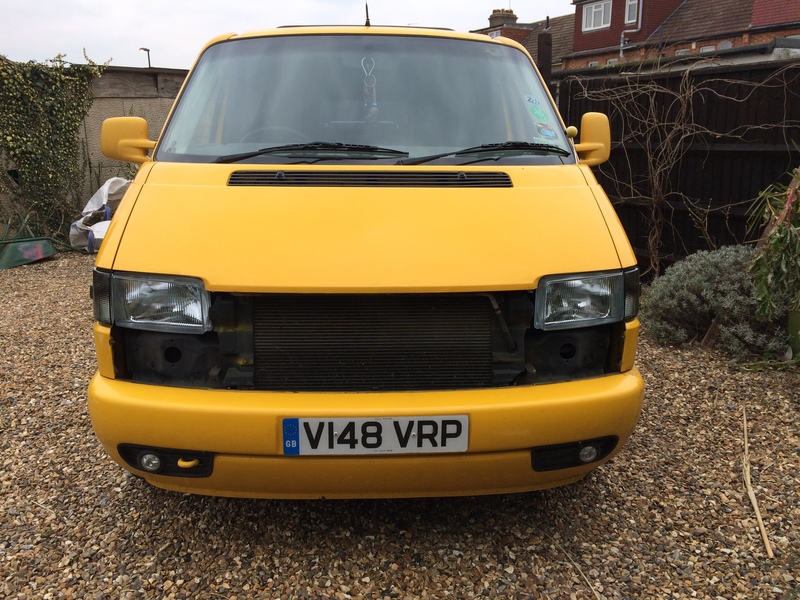 I also bought the headlight upgrade loom kit from Travelvolts, you can buy this from other places but I trust Martyn and his products so I bought it from him. First things first, out with the old, you have to remove the front grille which is held in place by four screws, two at the top and two in the lower grille, it then just pops out. 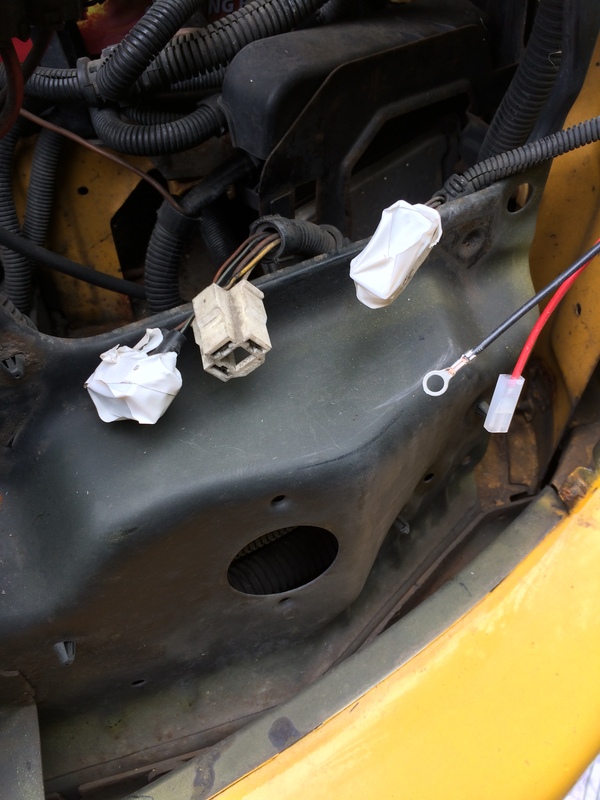 Once this is done you can unbolt and disconnect the headlights, quick nod to the previous owner or whoever fitted these for maintaining consistency with their poor work, both headlights were held in with 2 bolts instead of four.. Undo your bolts and unclip your bulbs and the lights come out, this is what you are left with. I came across what I think are the self levelling motors for the lights, one was connected to one of the DRL’s and the other wasn’t, I removed them both as my new lights have no way to connect them. Once you remove your lights you are left with a few extra plugs, I taped them up as I felt that would be helpful. 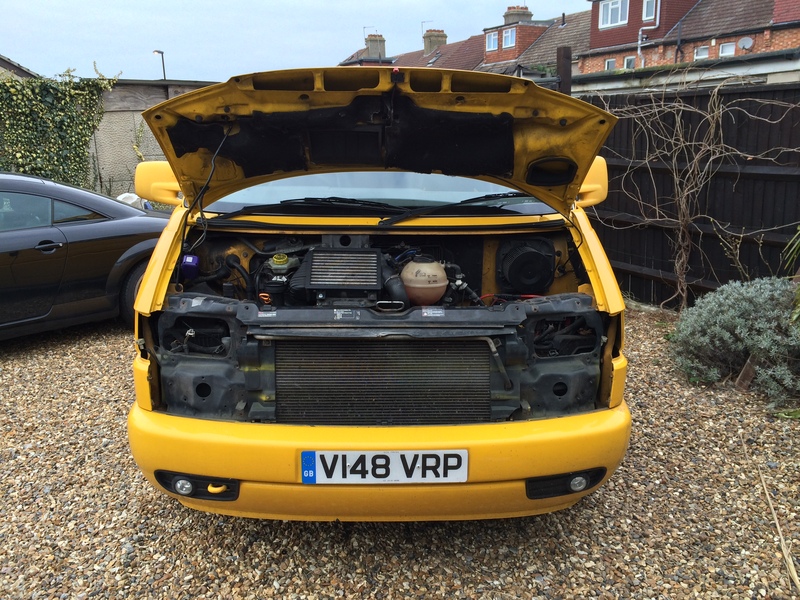 At this point I slotted together the indicators and headlights, I then fitted the bulbs and attached the wiring loom upgrade to the bulbs, this makes installing the loom a bit less fiddly. I then fitted the lights with four bolts for each, I had to pack the drivers side light out a little near the bottom with washers so it sat straight. 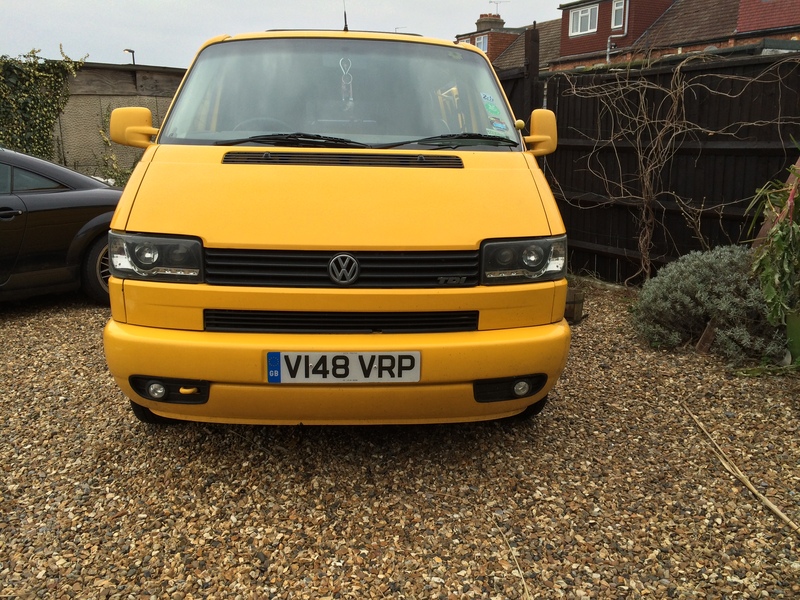 Last thing to do was hook up the loom using the instructions I downloaded from Travelvolts and test the lights before putting the front grill back on, I then took the van to the hand car wash as it was filthy. I’m really pleased with how they look, the smoked indicators tie in with the smoked rear clusters and the main lights IMO look better than the old DRL’s. I waited for nightfall and took the van out for a drive to see if the visibility had improved. In hindsight I wish I had taken a before and after picture for comparison, I cannot tell you how much of a difference this has made, dipped beam visibility has greatly increased and full beam is bonkers, you can see miles ahead, the bulbs give off a nice white light too, not quite Xenon but not far off, the light temperature also matches up with my fogs! If you are thinking about swapping out your standard lights for DRL’s my advice would be save your money and upgrade the looms and bulbs instead, maybe buy some smoked or clear indicators if you want to add a custom look. 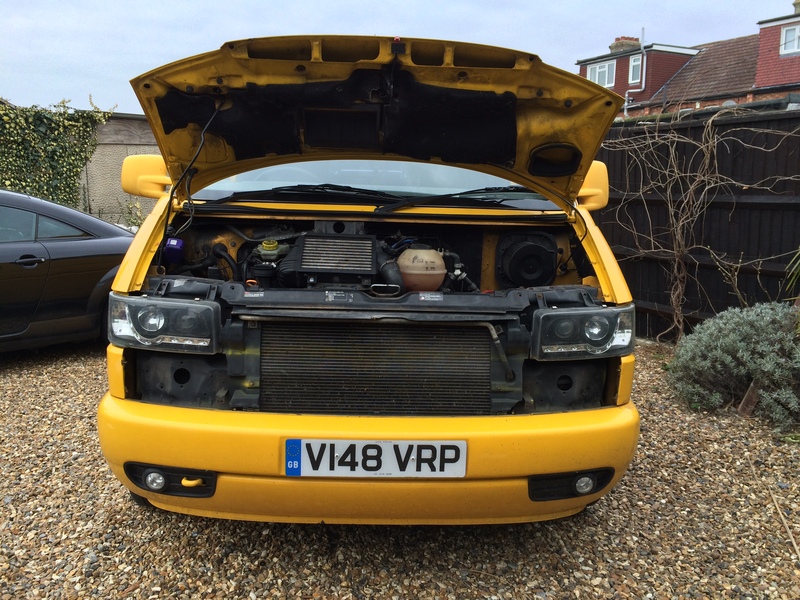 The total cost of this came to approx £170.00, the old DRL’s will be going up on eBay and I reckon I should get £100.00 back for them so with any luck, this will only of cost 70 quid, money well spent!